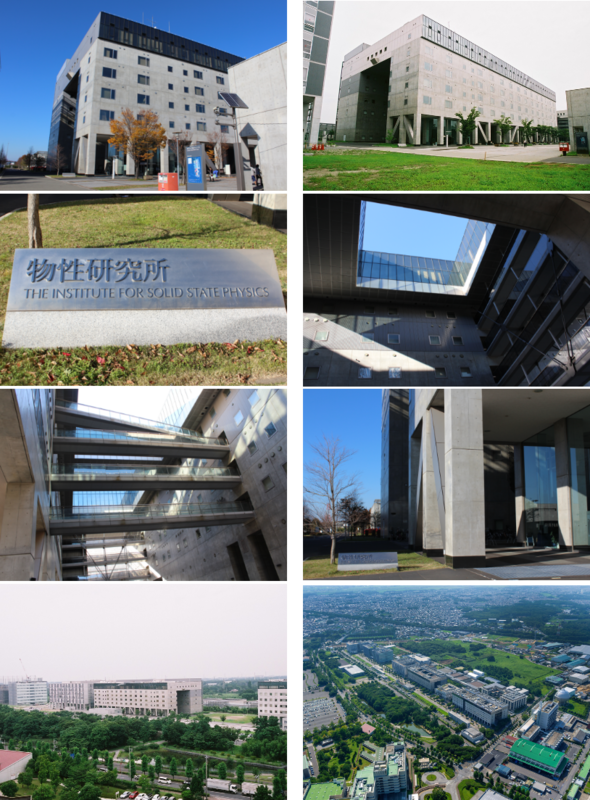 The International Summer workShop 2018 on First-Principles Electronic Structure Calculations (ISS2018) will be held in the Institute for Solid State Physics, the University of Tokyo, Kashiwa, of which place can be confirmed by Google map. An easy way to get the ISSP campus or the Kashiwanoha campus station from the Haneda airport is to take a KEIKYU Limousine Bus departing from the Haneda airport, which will take 1.5 hours. You can buy the ticket at a ticket counter on the second floor of arrival lobby in the Haneda airport International Passenger Terminal. If you go to the ISSP campus or the Kashiwanoha campus station, please get off at the first (Kokuritsu Gan Center) or second (the Kashiwanoha campus station) stop, respectively. 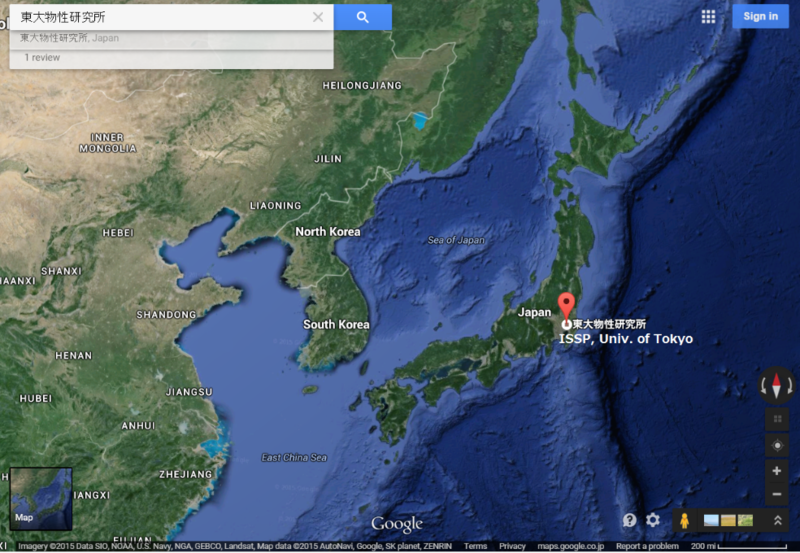 The ISSP campus and the Mitsui Garden Hotel Kashiwanoha are very close to the first and second stop, respectively. An easy way to get the Kashiwanoha campus station from the the Narita airport is to take a KEISEI airport bus departing from the Narita airport, which will take 1 hour and 45 minutes. You can buy the ticket at a ticket counter of the KEISEI bus in the Narita airport, which will cost 1700 yen. to change trains to the Tsukuba express to get the Kashiwanoha campus station, which will take 22 minutes. The ISSP campus is 1.8 km away from the Kashiwanoha campus station of the Tsukuba express railway, and it may take 25 minutes on foot. Also, there are bus services every 15 minutes in morning and evening, connecting the station and the campus, operated by the University of Tokyo and a local company. The summer school will be held in a seminar room (A615) on the 6th floor of the main ISSP building indicated by "A" in the map below. Cafeteria and shops where you can buy foods and drink are indicated by "T" and "V" in the map below. Participants staying at the Mitsui Garden Hotel Kashiwanoha will be able to take a bus departing from in front of the hotel in the morning to the venue. The departure time is 8:20 o’clock morning in all the three days. After the banquet held on the second day, Nov. 10, the participants will be able to take a bus departing at 20:10 and 20:30 o’clock from the banquet place to the Kashiwanoha campus station. 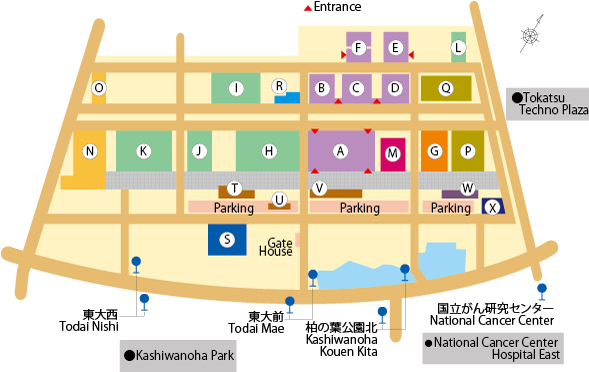 The free shuttle bus service connecting the Kashiwanoha campus station and the Kashiwa campus is available, which is operated by the University of Tokyo. The time table and the bus stops are shown below. The time table and the bus stops can be confirmed at here, When you get on the bus, please inform to a driver that you are a visitor to ISSP. A bus service connecting the Kashiwanoha campus station and the Kashiwa campus where ISSP is located is available, which is operated by a local company. You can get on the bus at a bus stop 1 indicated by the green box with 1 in the map below, and get off at the “Kokuritsu Gan Kenkyu Center” or “Todai mae” stop, which is just nearby ISSP in the Kashiwa campus. From the Kashiwanoha campus station to the bus stop nearby ISSP, it takes less than 10 minutes. In the morning the bus is operated every 10 minutes. The fare is 170 yen.